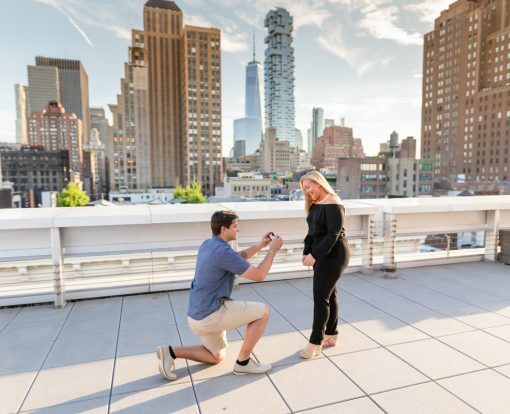 There’s no better place to propose than in front of the classic skyline of NYC. 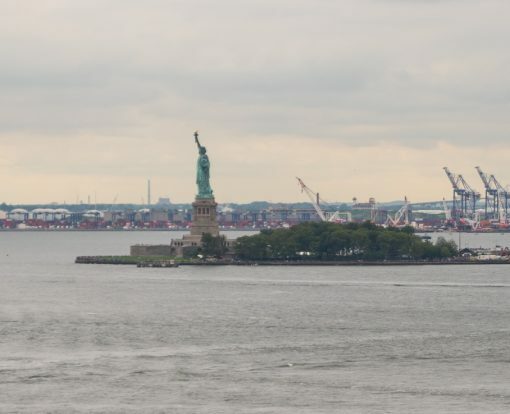 Let the Empire State Building and Freedom Tower be the backdrop of your private marriage proposal. Are you looking for something private? 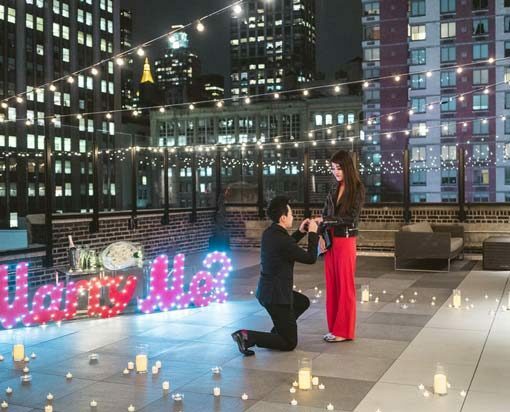 Surprise your partner with an intimate rooftop proposal that’s magical, comfortable, and endlessly romantic. Tailor the proposal to fit your aesthetic, and request any decorations that you want. Whether it’s flowers, candles, or musicians, we’ll do what it takes to make this moment unforgettable. Hired Proposal 007 to capture that special moment. Communication was excellent and they provided our pics (over 370) to us within 24 hrs. The pics turned out awesome and we have received so many complements. Vlad is a great Photographer, easy to schedule, good email and text communication, timely delivery and outstanding photographs. If you are in NYC and you want to propose you should consider his service, very professional. Proposal 007 were resourceful and awesome in helping to make sure everything goes according to plan. They captured our best moments and were very quick to provide us with all the photos and videos after that. New York is a magical city. It is hectic, vibrant and so full of life, that people from all over the world are coming here to ask the main question. The city view, with all the lights and skyscrapers is a perfect background for an intimate proposal. We truly believe that proposal on a private rooftops is an unforgettable experience that will stay with you forever. That is why we are concentration to bring that experience to our customers. The rooftops and terraces that we are using are all private venues, with no people around. We are dedicated to bring an unforgettable, stress free experiences to our customers. Our professional photographers will make sure that you will have this moment documented in a best possible way. If you are planning to propose on a private rooftop during the summer season, you made a right choice. Summer is the rooftop time. It is magical, warm nights and fresh air – ideal for surprise engagements. But rooftop by itself, won’t make the magic, you still need to think of how to enhance your proposal. We think, that some decorations can be a key point for an ideal engagement. 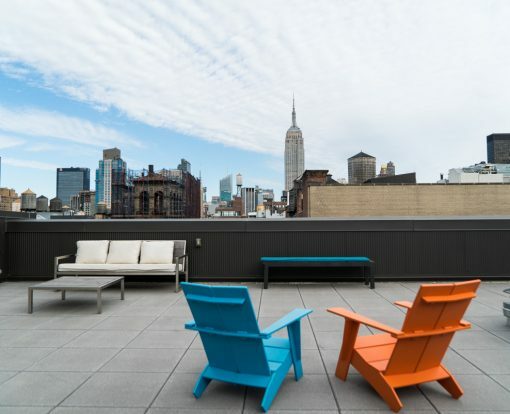 Here are our 5 tips for a summer rooftop decorations. 1. Real Flowers Nothing is more romantic as the real smell of the flowers. We can make a flower arch or cover the whole floor in the real rose petals or maybe you want a magnificent flower heart on the floor? The main thing is to use the real flowers and real flower petals. You would be surprised, but we had guys who were buying fake plastic petals and cover the floor with it. The look and the smell were not romantic at all. So use only REAL flowers. 2. Private table for two. Summer rooftops are ideal for a romantic dinner or champagne celebration. To enhance the moment, put the nicely decorated table with the tablecloth, champagne, and strawberries on the roof. Just imagine, she says “yes” and you two opening a champagne and calling your family. Also, what a perfect way to tell her all about your proposal planning as not with the glass and glorious view. 3. Illuminated Props If you are planning a nighttime proposal on the rooftop, you definitely need some candles and illuminated props. The more lights the better. We love using the red candles in glass vases as it looks very classic and romantic. Also, any kind of string lights and fairy lights will work. For those, who want to bring the proposal to the next level, the illuminated ‘MARRY ME?” marquee letters will make her “WOW”. Just don’t overdo it. It needs to be balanced and look stylish, as the main spot of attention should be your significant other and not the props. 4. Pictures One of the best way to see how far you came from ” dating” to ” getting married” is to make a memory walk through the pictures. Print the pictures and place it around the roof, or clip them on the wires and let them hand around. She will be touched to see all those good memories hanging there. 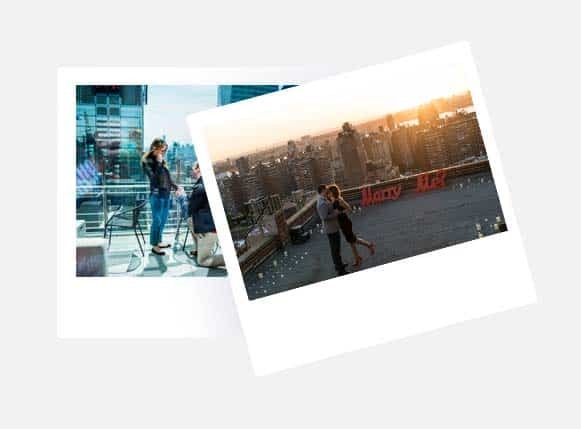 If you want to have fun with it, we can order an Instagram picture frame and place it on a rooftop. You can start making memories right there! 5. Movie/Cartoons scene decoration For those couples, who loves ” Beauty and the Beast” or ” Friends”, just imagine how wonderful it will be to decorate the rooftop with the enchanted rose and lights from the world famous love story. If she always dreamed of being a princess, give her that chance on this special night. Prepare a princess dress, hire a musician and let the fairy tale come into your life. 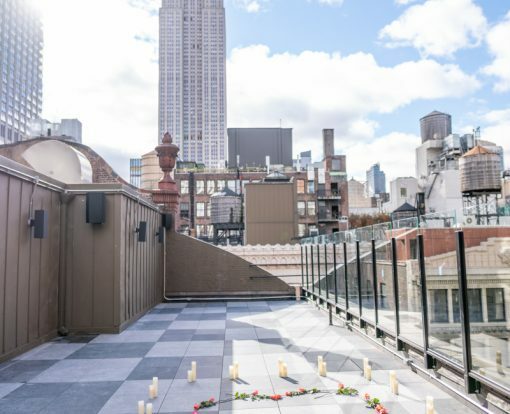 If you are planning to propose on a rooftop in New York, but don’t know where to start, contact us directly at info@rooftopproposal.nyc and we will help you to choose the right venue and make your proposal unforgettable. Summer is finally here and the rooftop season is officially open. As most of the couples are looking for a nighttime proposal, we would like to discuss the advantages of making a daytime proposal. 1. Surprise She definitely won’t suspect anything if you invite her for a brunch date. Most of the girls expecting the ring at or after dinner, so brunch won’t be suspicious. 2. Flowers Daytime proposals are perfect for amazing flowers decorations. You can decorate the rooftop with her favorite flowers or we can create a wonderful flower wall or even flower “marry me?” sign. Just imagine sun, flowers, rooftop and you two enjoying the view. 3. View You can actually enjoy the view. Unlike the nighttime proposals, during the day you can actually see the city and enjoy its vivid colors. 4. Photo and Video Pictures and video are much better during the day then at night. So the pictures from the daytime proposal will be more colorful and have vivid colors. 5. Time Proposing during the day you automatically saving time for a dinner celebration. The ideal time to invite her friends and family. She would be glad to know that you plan everything so thoughtfully. 6. Availability Rooftops are more available during the day as most of the people looking for a nigh view. Its perfect opportunity to choose from the best places that you liked. 7. Price Most of the private rooftops lower the prices for a day proposals, so its a perfect way to save some money. Daytime proposals are the perfect way to start a day and make that day unforgettable. With the warm summer, private space, amazing view, and chill champagne, your daytime proposal will be something she wouldn’t forget. 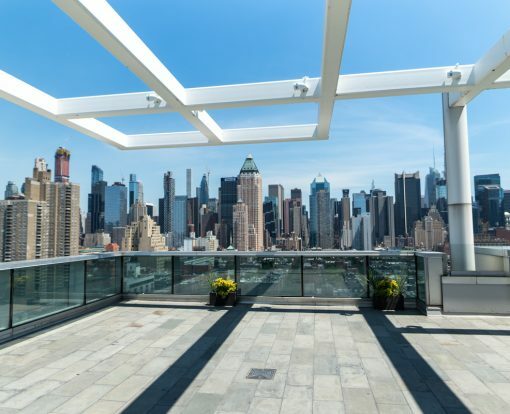 We are excited to offer you 4 breathtaking rooftops that will be ideal for a daytime proposal. If you planning your proposal and don’t know where to start, contact us know and we will be happy to help you out. Our experienced team is here to make your engagement unforgettable and stress-free . Spring is finally here and it is the perfect time for a breathtaking engagement. It is the time, when the days are getting longer and warmer and everything around is getting full of life and love. So how to use this season for a romantic proposal? 1. Invite her to a romantic picnic There is something unforgettable in the private picnic on a rooftop with the view that will take her breath away. Close her eyes and bring her to the secret location. When the elevator doors open up you can take the blinder away she will see the picnic table with your pictures on it and a “Marry me?” sign next to it. Enjoy the moment and your picnic. 2. Easter Eggs Scavenger Hunt This is a wonderful opportunity to show your creativity and surprise your partner. Write a ” Will you Marry Me?” note in one of the eggs and let her find it. She will be caught off guard and definitely appreciate your cleaver proposal. What to do it on a rooftop? Even better. We can decorate the area with the baskets and eggs, all you will have to do it to walk in and propose. 3. Painting Class Tell her that you bought a private painting class for two. She will think that its a date night and wont suspect anything. While you both paint the same picture, you add ” Will You Marry Me?” on yours and we setting up the outdoor area behind her back. When the time will come, show her your art work and get on one knee. After affirmative “Yes!” take her hand and bring her to the rooftop, where candles and champagne will be waiting for you. 4. Cherry Blossom Festival Yes, Spring is famous everywhere with its gorgeous cherry blossoms. Invite your partner for a romantic walk and propose under the tree. Want to incorporate the idea for the rooftop? We can set up the place with life orchards, so when you walk in the sweet aroma of the blossoming flowers will please your senses. 5. Invite your partner for the astronomy night. Who knew, but spring time is famous for its meteor showers. Invite your partner for an astronomy night. When you walk into the rooftop, you will see the telescope and comfortable pillows with the ice bucket and champagne. Enjoy the starry night and ask her to be your wife on the falling star. We hope our spring ideas inspired you and you ready to make your unforgettable proposal. The main thing, keep it in a secret, dont stress out, enjoy the process, hire your photographer. If you have any questions or comments please email us directly, we would like to hear back from you. Its finally winter in the city and the holidays season is at its bloom. With the weather change and snow on its way, rooftops might not looks like a good choice, but hold on. 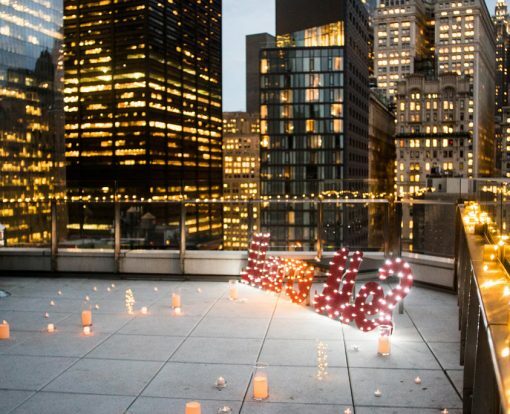 Here is our top 5 winter rooftop proposal ideas: Rooftop with the fireplace. That is probably the most romantic way to pop the question. City lights, cool wind and hot flames will definitely make a magic combination together. Propose on the terrace outside and enjoy glasses of champagne by the fire. Make a double surprise for her. Tell her that you going to the new bar and bring her to the rooftop. 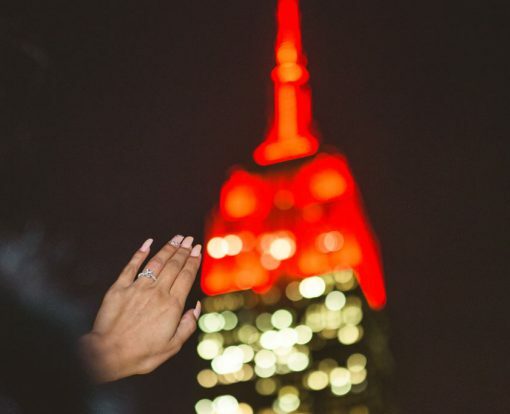 Propose with the Empire State at your background. After she said “yes” tell her that you going to the restaurant for the celebration, but instead take the elevator one flight down and surprise her with friends and family gathering. Perfect winter proposal with the family! Its a scavenger hunt season. You can include your friends for this proposal idea. Sign up for the scavenger hunt or make your own. Leave the clues and answers all around the city. Let the last one be the address of a private terrace. Propose with the view and let her wonder how you organize all that . Gallery show opening. Official invitation to the new gallery opening will lead to the private space with the pictures of you two. Candles will show you the way, Make a walk through the relationship and propose on a terrace overlooking the Manhattan skyline. Perfect indoor and outdoor proposal idea. 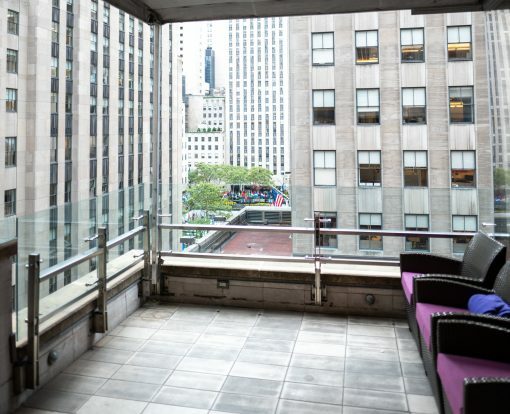 Rent a penthouse suite with the private terrace and chief. Little fancy holiday proposal idea will bring you to the luxury hotel in the middle of Manhattan. As soon as you open the door to your suite, you will see candles and rose petals all around the room. Follow the rose path to the terrace, where the fireplace will set up and a chill champagne will be waiting for you. Get on one knee and ask the main question. Bring the celebration to your room. The private chief will be cooking your favorite food and you can just enjoy the time with your love. This is just some of the proposal ideas that can be done on a rooftop during the winter time. Of course there is always a chance of snow, but believe us, there is nothing more romantic then staying up on a rooftop with your partner under the snow and enjoy the beauty of the city. Benefits of the private rooftop proposal in NYC Holidays season is finally here and New York is completely transformed and ready to celebrate winter. It is also the perfect time to pop the question to your second half. The only problem that it is a high tourist season and if you don’t want to get stuck in the middle of the crowd and looking for a more private location, than private rooftop will be your best choice. Most of the rooftops in NY are either private or public. Public rooftops are open to the people from 8 am to 10pm and have strict rules regarding the photo and video equipment. Private rooftops are harder to find, but it will totally worth it. 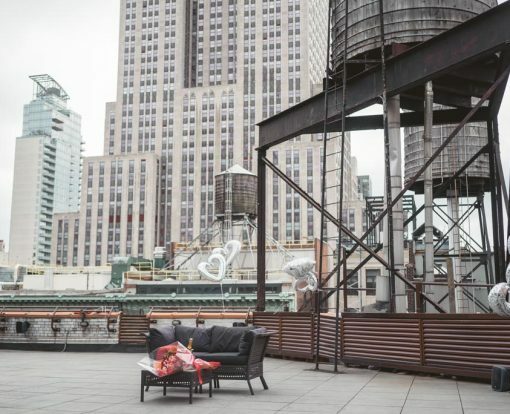 Here are 5 good reasons, why you should pop the question on a private rooftop. Privacy is the main reason. You don’t need to worry about other people and can show your emotions at the fullest. No judgment, no clapping just you two in a private, intimate atmosphere. You can be more creative. Private rooftop is a perfect place to show your creative side and surprise your partner even more. It is your magic space where you can do whatever you want and express yourself freely. You have no limits for photography and video. It is very important to have a professional photographer to capture this moment, but its also important to provide a good environment for him to work. Most of the photographers loves to use equipment such as lamps, different lenses, tripods and maybe even a drone to capture the moment. Private space guaranteed that their equipment is safe. The more comfortable your photographer is, the better your picture and video will be. It will be a big surprise for your partner. You invite her for a rooftop bar or colleagues birthday party, so that she will be at her best look and instead of a crowd of people she will find a beautiful romantic place. Surprise guaranteed. The view. One of the main reason why you can choose the rooftop is definitely the view. New York City skyscrapers and lights makes you feel the magic of the city, that is something you want to share with the closes person, your partner. We love rooftops. We think that the best way to pop the question is in a private, intimate and friendly environment. We are working with 10 different venues from all around the city, and its not bars or restaurants, it is private rooftops and terraces, that guarantee you the privacy at that magical moment. If you want to propose on one of our gorgeous rooftops, contact us now. We will answer all your question and will help you to the choose the best place. 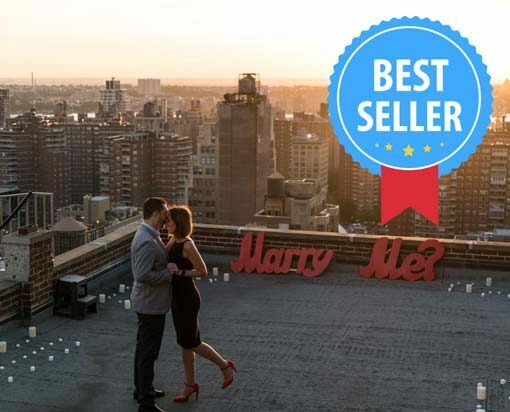 RooftopProposal.nyc is the part of “Proposal007” – the leading NYC based proposal planning and photography company. Over the past 5 years Proposal 007 helped plan and capture more than 1000 proposals in NYC.